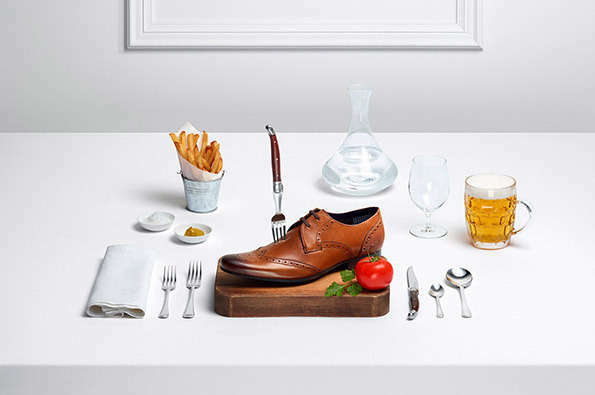 The Ted Baker Tastefully Ted ad campaign takes footwear and still life to a very appetizing level. Laid out as though it were the main course to a gourmet five course meal is a collection of both men's and women's shoes that anyone would find themselves drooling over. In one case, a print ad reads, "(On occasion) a lady may have her cake and eat it too." Lensed by photographer Sam Hofman, the Ted Baker Tastefully Ted ad campaign was created in collaboration with food stylist Iain Graham and set designer Linnea Apelqvistto. Captured against a predominantly white scene with only few pops of delicious color here and there, the footwear being showcased really stands out. It's Nice That writes, "[W]hile it’s got a recognizably commercial aesthetic, there’s also a sense of fun running throughout."